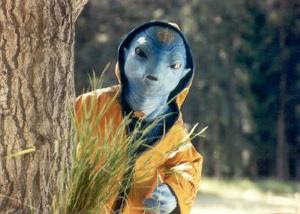 NASA today released high resolution images of a humanoid alien on an unknown planet, claiming he was the one driving Salman Khan’s car that ran over five pavement dwellers, killing one of them. However, as it has already been established beyond doubt that no one was driving the car that night, NASA’s sensational claim has been regarded by many as a cheap publicity stunt. When we contacted the alien, after Air India One dropped us off on his planet on its way to Mars, he was listening to The Newshour Debate as the Editor-in-Chief’s voice was faintly audible from his planet. He admitted being behind the wheel when the incident happened on that fateful night; however, he reaffirmed that no one was driving the car. When we informed him that his revelation could have legal implications, he said, “Chill. I have full faith in judiciary,” and winked at us.